This summer of 2013 is turning out to be a back-to-nature trip for me. The summer of 2012 had me traipsing about in Boston and Atlanta and a few months after that, I hied off to Singapore, where everything cool, new, cosmopolitan, and magnificently man-made was always coming out. I had always considered myself to be a city girl, even though I grew up in the countryside, because I loved the fast-paced life, the lights, the diversity, and the opportunities always jumping out at you in big cities. But this summer, I took a step back and decided to try a different approach. My full and very eventful 2012 and clerkship year in medicine kind of blew the wind out of me, like I was on mega-doses of adrenaline all the time. So come summer, I chose to relax a bit, explore bits of my own country for once, and get in touch with nature! So, get in touch I did. 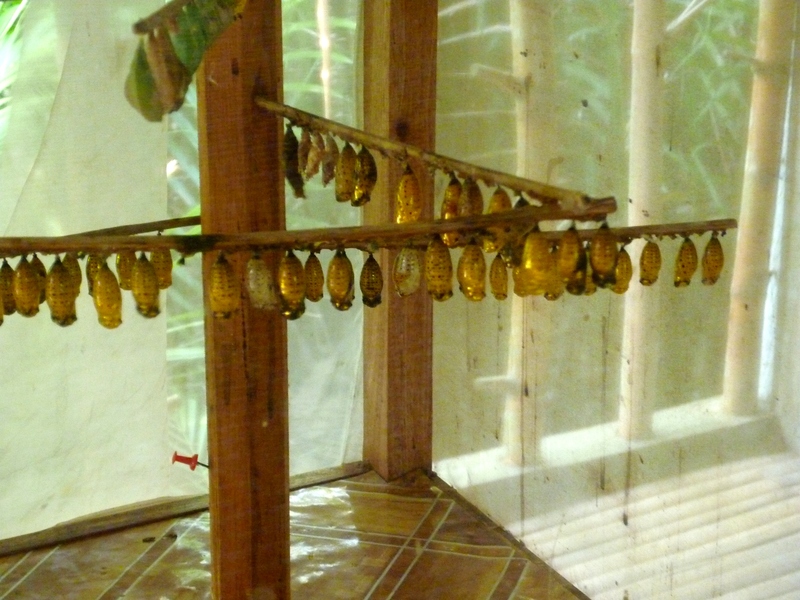 On this particular stop at the Butterfly Garden, I really wasn’t expecting any surprises. 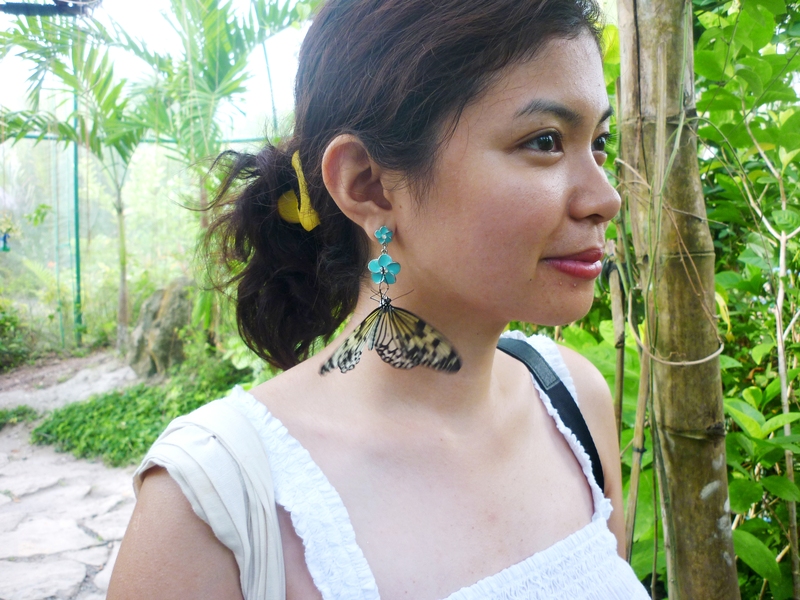 I’d been to other butterfly gardens before, stepping into a bright dome where butterflies freely flit about and surround you. But, as always, when in a new place, I like to see what the place has to offer. You never know what lies in store for you, right? 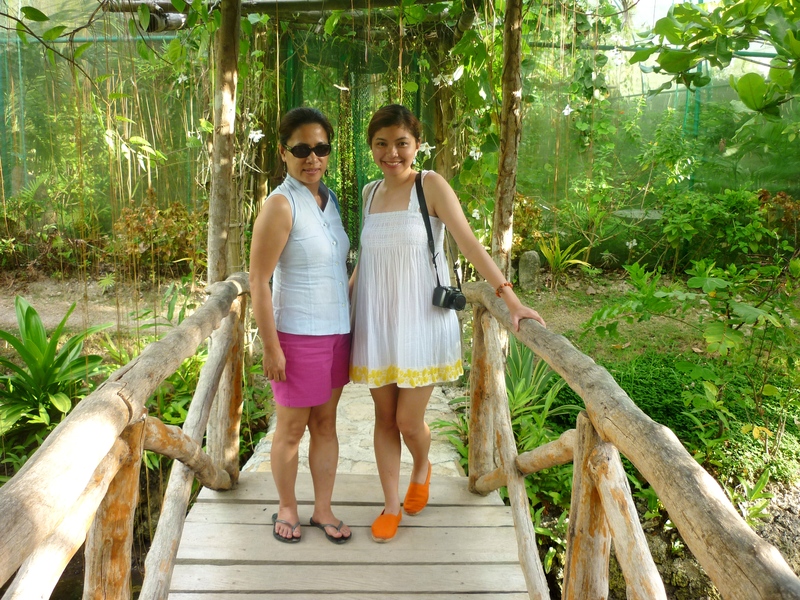 Upon entering a building made of bamboo and thatched-grass, we were greeted by our witty guide. I didn’t know there was a tour! I thought we would just walk about a garden with butterflies. 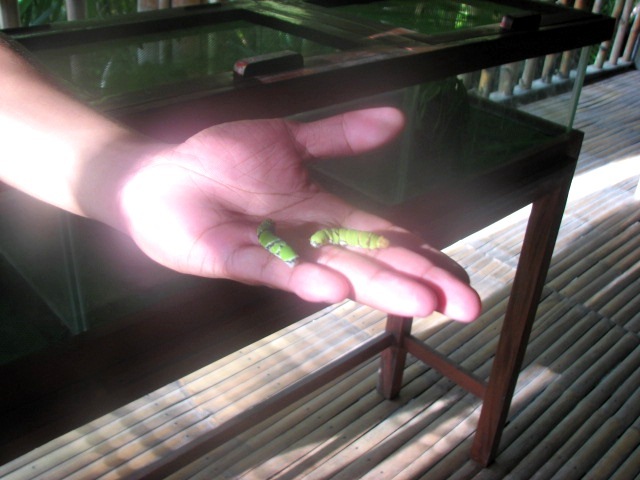 He actually asked me to hold out my hand, with the intention of dropping the caterpillars on my hand, but I said NOOOO. I’m quite phobic about caterpillars, especially the FAT, GREEN ONES chomping and chomping on leaves in your backyard and growing fatter and fatter by the day. I can’t quite rationalize it, but they scare the hell out of me. I really don’t like wriggling things!!! But nevertheless, I politely listened to his discussion about the life cycle of butterflies. Oh, god, NOT THE ONES WITH SHARP SPIKES, PLEASEEEEE. I was trying to concentrate on the mini-lecture, but I was inwardly freezing and feeling deathly afraid. It’s very amusing and strange, this phobia of mine, but it doesn’t make it any less valid. I really do feel it, no matter how silly! I know caterpillars are not your garden-variety and ultra-threatening and very-much-despicable higad (those pesky hairy wriggling things that like to fall out from tall trees just when you walk under the trees and then land on poor, hapless you and make you break out in itchy, itchy, ugly rashes after…ugh!!!). But still, I SQUIRM AND SWEAT when I see them. Oh, please have mercy, Mr. Guide, DON’T YOU DARE PUT THAT IN MY HAAAAND!!!! Well, at least, these were harmless-looking compares to the previous ones. I heaved a sigh of relief. I could definitely handle this now. 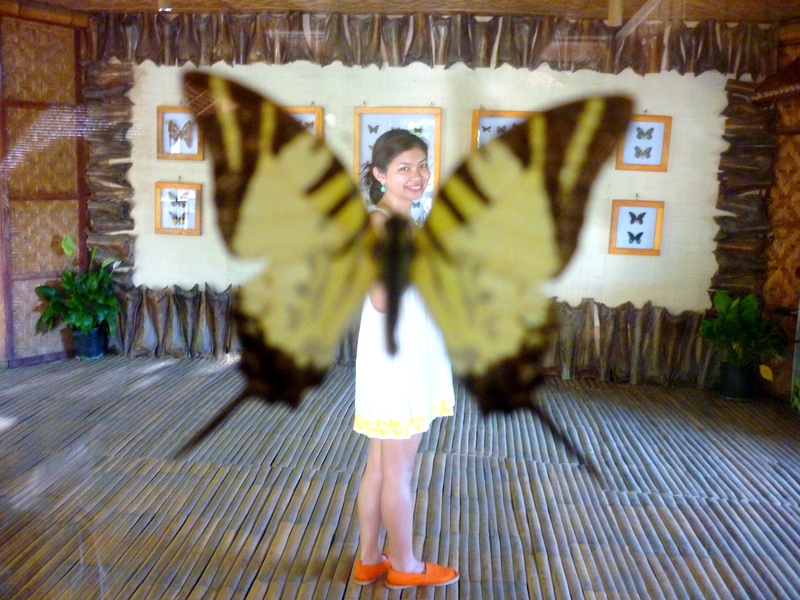 What I was holding was not really a butterfly, but a moth. 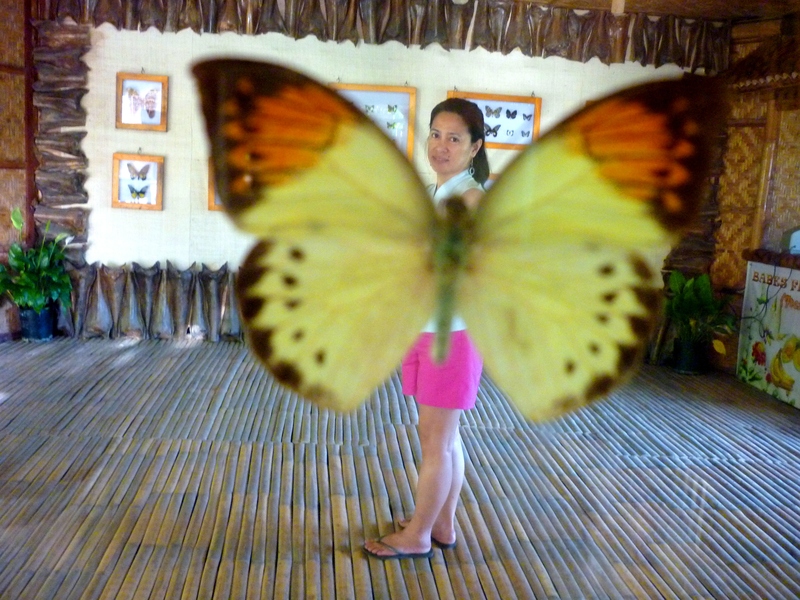 It’s known in the Philippines as the legendary mariposa. 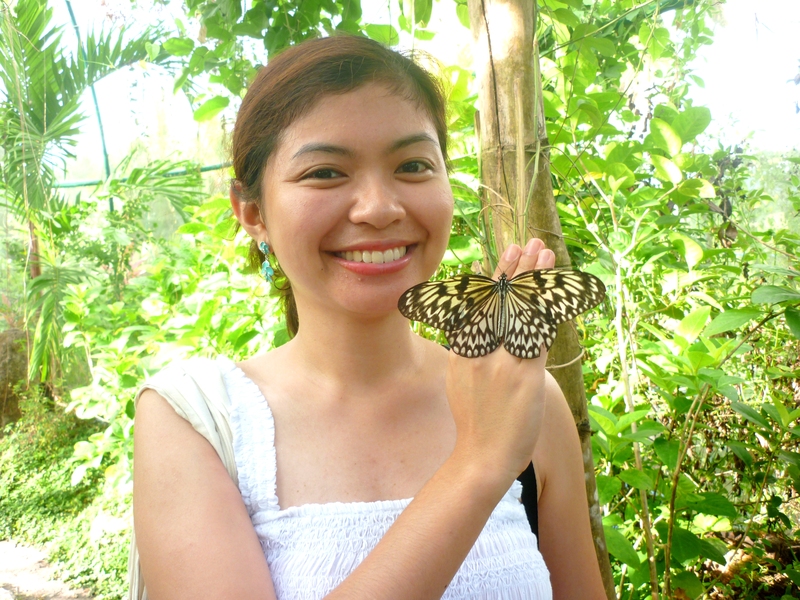 (Sudden flash – strains of the Sugarfree song with the same title hit me as I was looking at the beautiful creature: “Dahil dito sa mariposa ay mahirap ang nag-iisa…” You really have to hear this song because it really is fit for the beauty of this moth. It’s a love song, but it is sad and haunting at the same time, quite like the ethereal and magical mariposa.) In other parts of the world, it’s known as the Atlas moth. 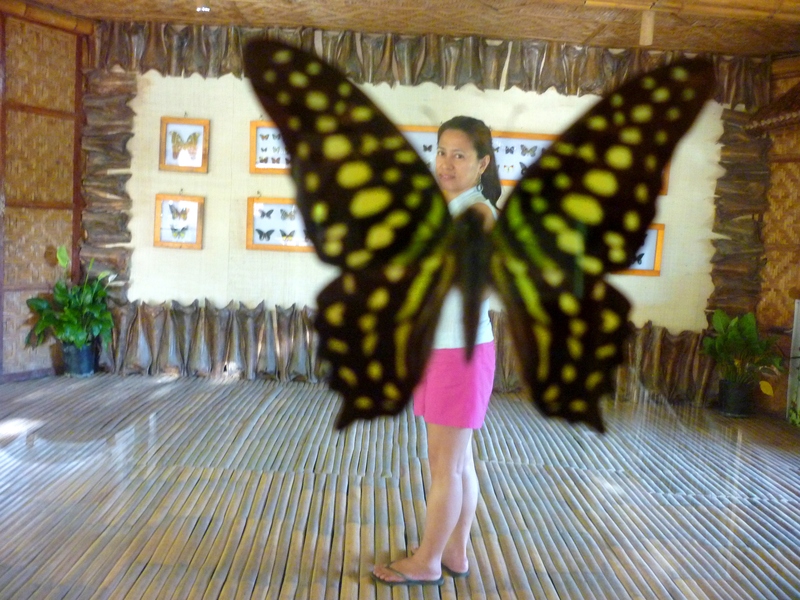 Our guide told us the female mariposa is significantly larger than the male, all the better to attract them guys. The guide was a rather funny guy and made jokes about the mariposa, saying that a popular matinee-idol-turned-gay-queen was bitten by the mariposa, hence he unleashed his true colors. Hahaha. But this next one was the shot I loved best of all. The color of the wings was perfect for me. Don’t you think so??? 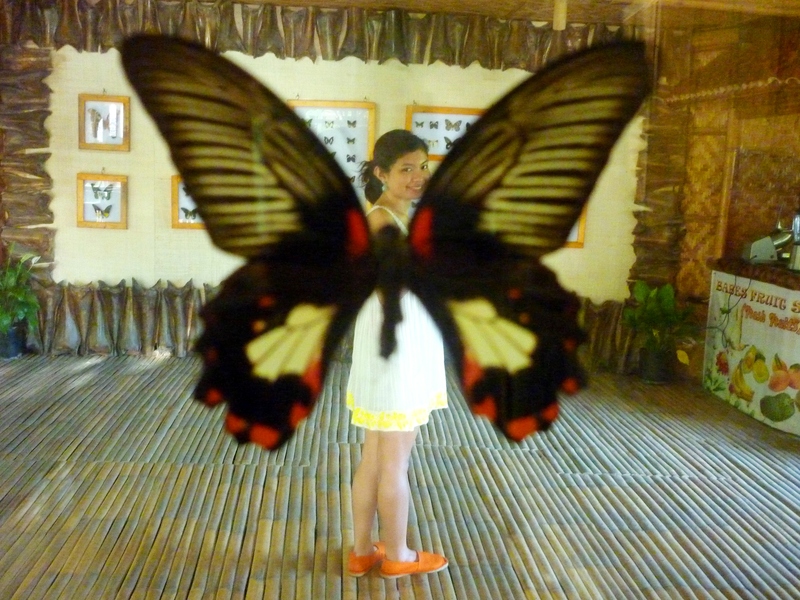 After that fun, fun exercise, it’s time to go in and meet the butterflies! But first, we must reach the entrance by going through a “hanging bridge”. And …. now…. 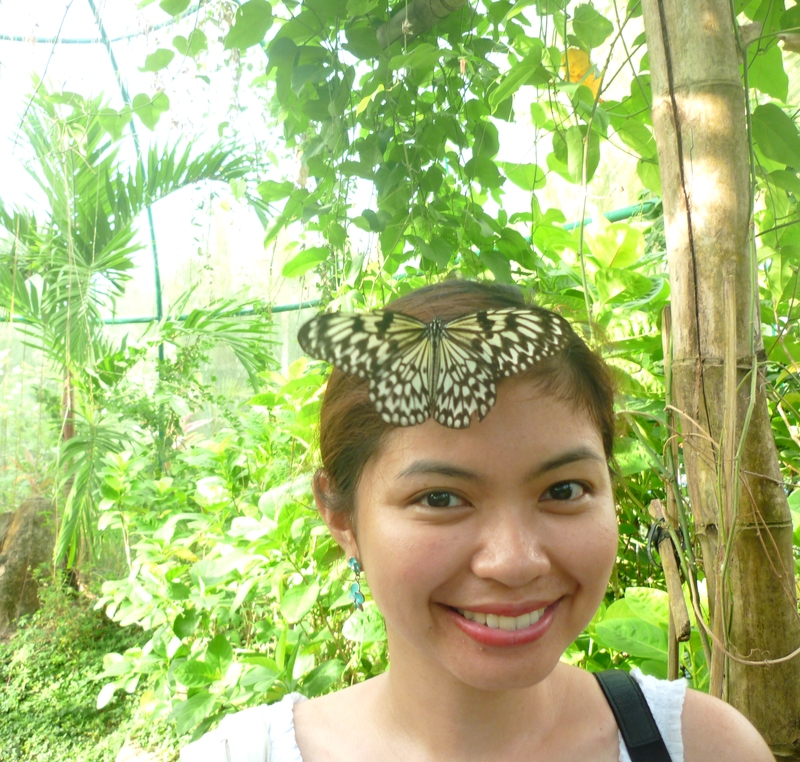 *drumroll please* the moment we’ve all been waiting for… our up-close-and-personal encounter with butterflies. 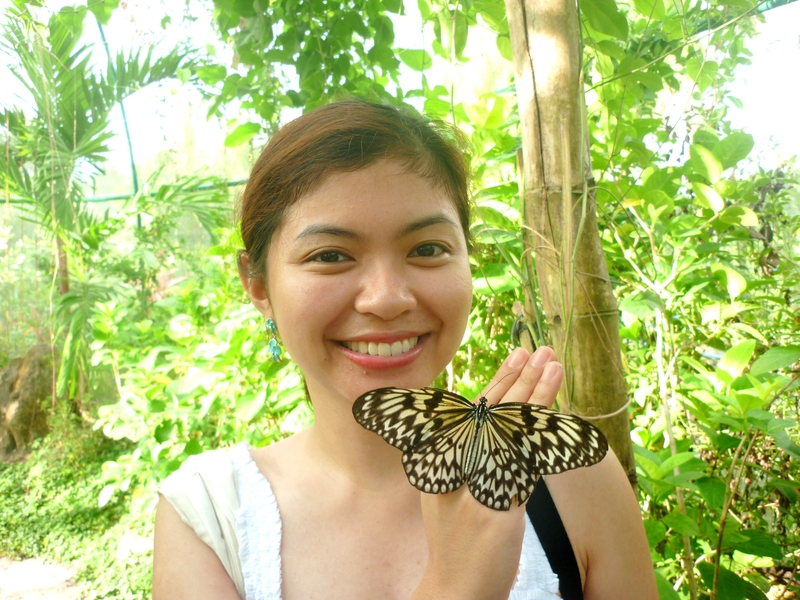 This is me feeling (a little bit of) trepidation at “holding” a butterfly. 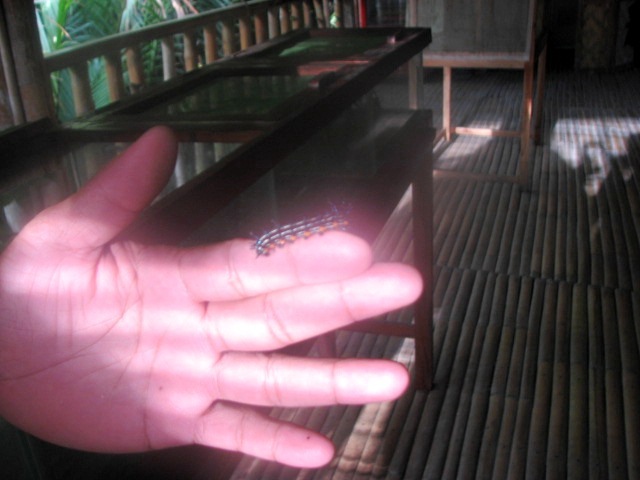 Having seen the caterpillars, I was quite hesitant to let the butterfly perch on my fingers. This beautiful creature came from those ugly wriggling things – NOOOOO. But, phobia aside, I decided to be open to the experience. Here I am trying to look more comfortable but I really was as stiff as a board that time. 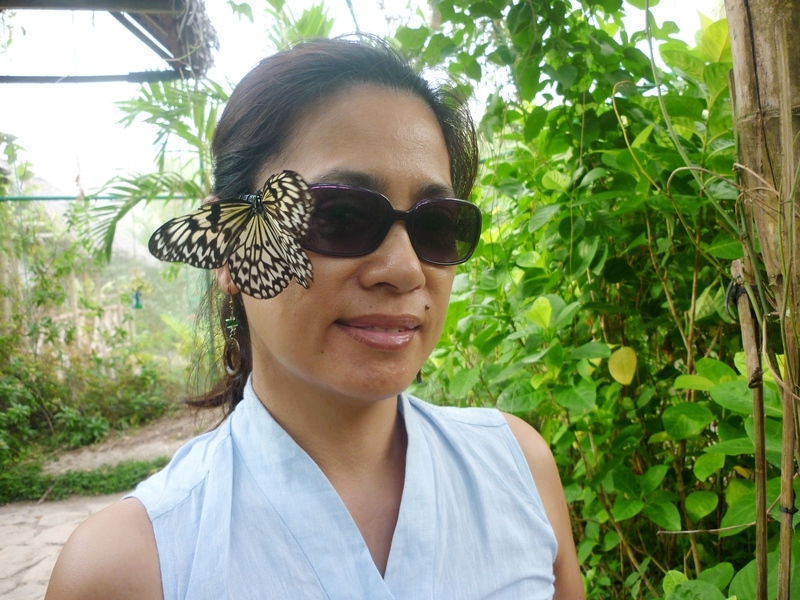 Here are other shots of the butterfly flitting about my face. It really IS bizarre to have a living thing moving so closely to you and having this intimate encounter. 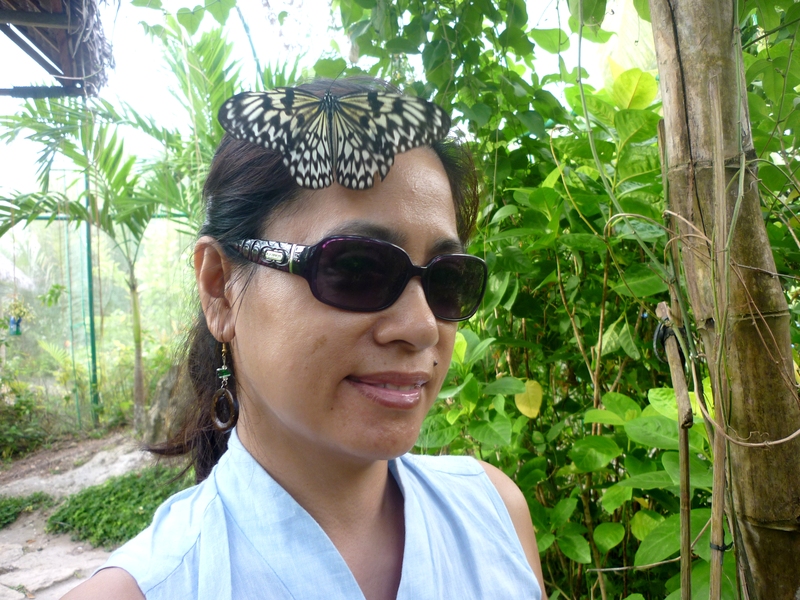 My mother also had her turn with the butterflies! 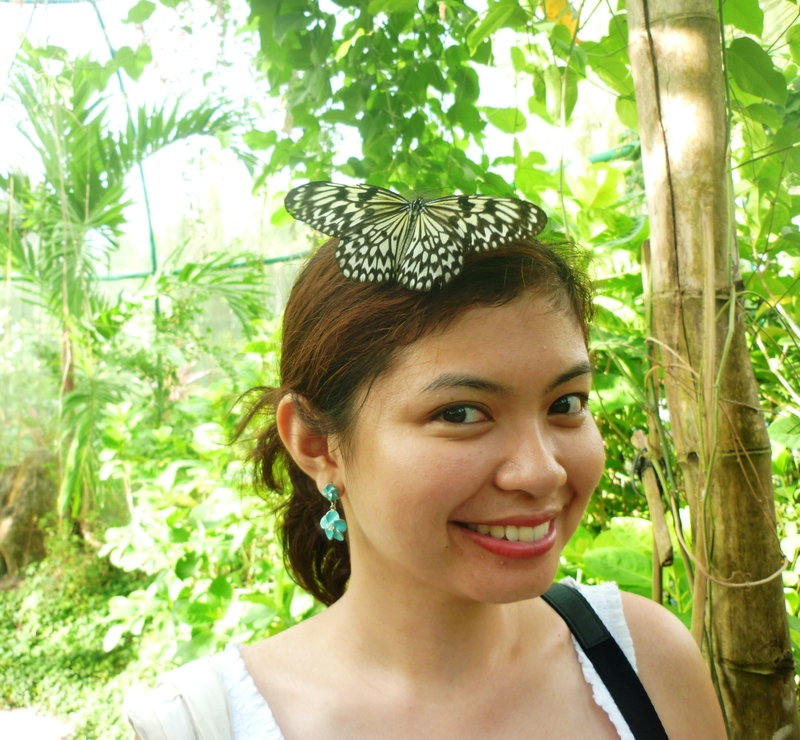 Say hello to the queen of butterflies! 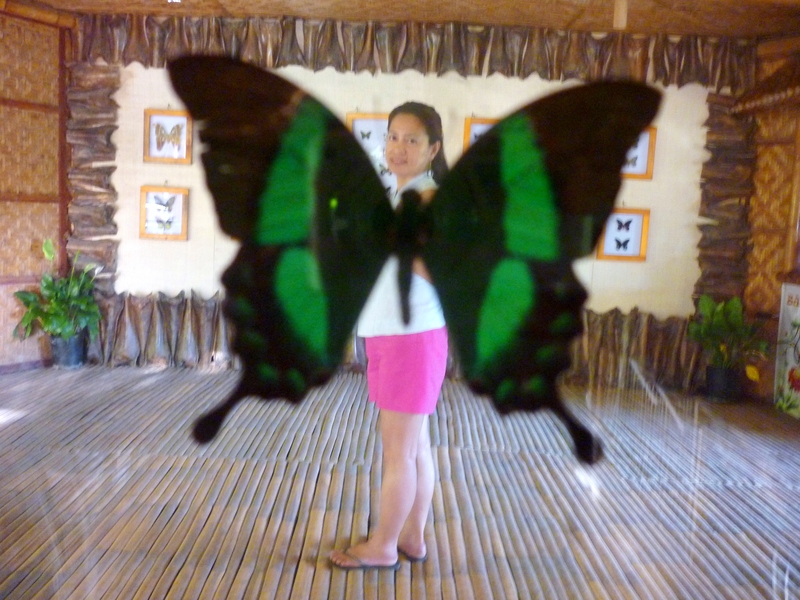 Our guide then let us smell the underside of a butterfly so we can sniff its pheromones. My, my, my, I didn’t know a male butterfly can give of a musk that smells EXACTLY LIKE VANILLA (my favorite scent). 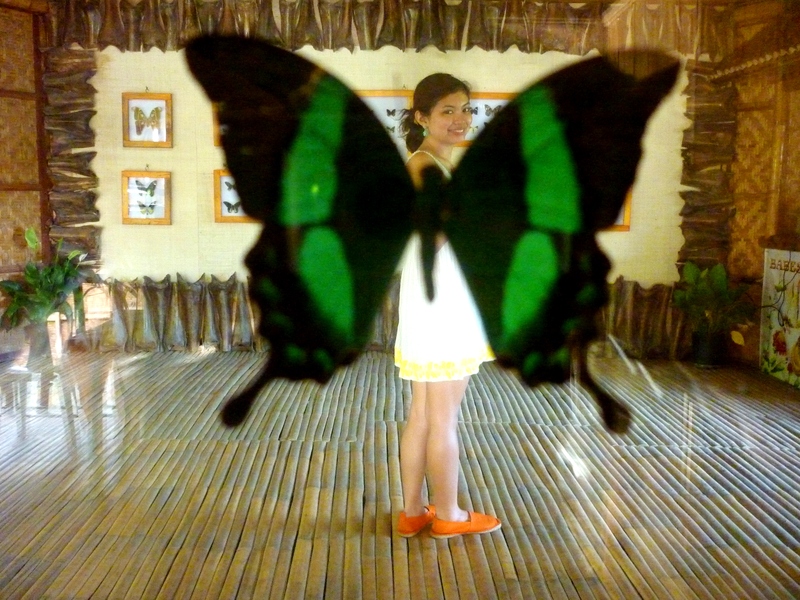 We also learned that a butterfly’s wings revealed a lot about its age. 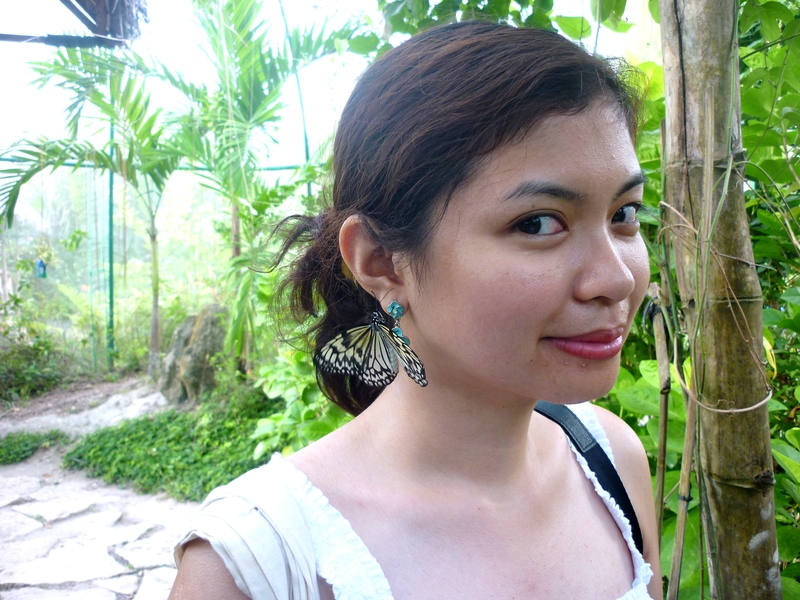 Apparently, the more serrated a butterfly’s wing is, the older that butterfly is. 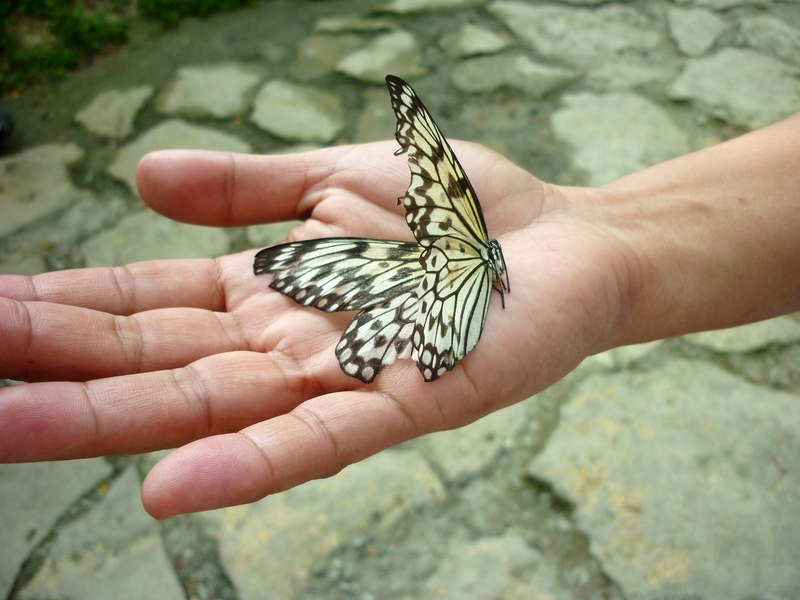 We got to hold this aging butterfly just in time. 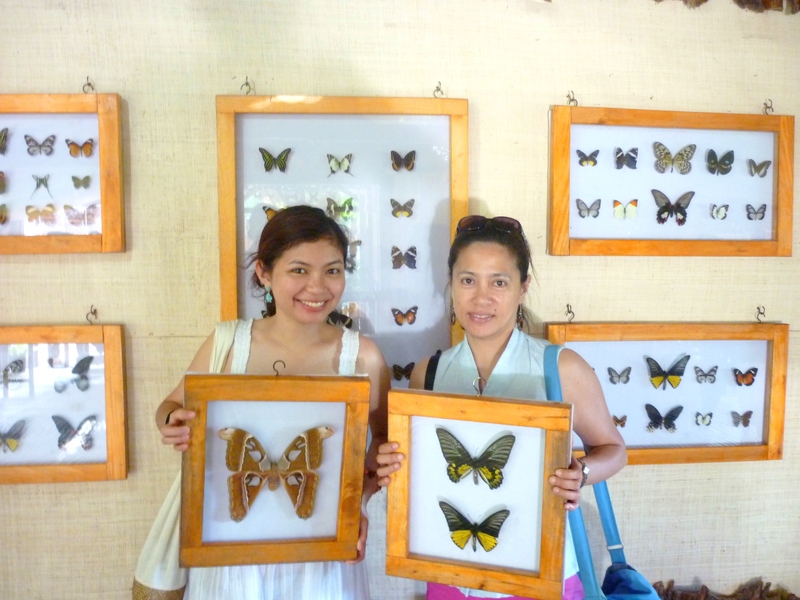 Our short visit to the Butterfly Garden was not only fun, it was also a learning point for me. I got in touch with my fears (er, phobia!! ), but at the same time, I was able to do the sort of thing I would never be able to do in the concrete hospital jungle that is my world for most of the year. It felt good to be holding a living thing in my hand, not because I was the medical student trying to help save it (as is the usual case back home), but I was just looking at it, letting it be, discovering something about it, instead of trying to intervene with it or label it with all sorts of diagnoses. I guess for someone who is at the hospital 90% of the time, little things like this are refreshing.